Firefly Camp: I Am Contractually Obligated To Continue Science Saturday For IBDIND, Inc.
IBDIND, Inc. has been trying to get hold of me for the past 12 hours in effort to see if I had finished my Science Saturday piece. Well here it is boys and girls, long overdue. But know this: you won’t have Eric to kick around anymore when I am restored as rightful head of IBDIND, Inc.
Fireflies, or lightning bugs, are a biological wonder. They pulled the most beautiful raffle ball out of the evolutionary design bag. They aren’t safer for it, but at least they can dazzle humans where their light bulb antics. The firefly produces light from its abdomen to attract mates through a process called bioluminescence. It is a process that I know well because, in my days at the University of Florida, I spent two weeks with my “Introduction to Entomology” classmates at a firefly study camp near the Florida-Georgia border. It was the summer before my sophomore year of college, when fireflies are typically active. The radiant dance of these insects is an elegant mating call, a 1-2-3-waltz number waiting for a partner. 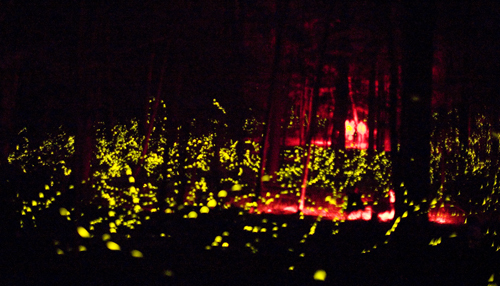 In this dangerous dance, the fireflies risk their lives, for larger predators may also see the light. I looked at Wendy on the especially heavy days in the hot wooden cabin and acted as if I were blowing my own brains out. She would laugh and return her own sign language, hanging herself or guzzling a handful of mom’s pills. At night, we got to watch the fireflies. The class scattered in all directions and you could hear each foot crunching pine needles. Wendy and I traveled off on the first night into the dark to collect a sample size of five fireflies each. We took two hours. Dr. Foghett generally paid us no mind. This was camp, college-style. Toward the end of the first week, the class was sent out again to collect a sample of fireflies. Wendy and I headed north into the woods as quick as we could then slowed to a stroll. She pulled out a flask of Bacardi. We were in college. Our purpose for being in the woods was soon shed from our skin and lost in the woods just like all the pupae’s skin. There wasn’t a path to follow. My stomach got full and burned and Wendy’s did too. I watched her face get red and her smile grow wider and wider. Then, to our left, our purpose was illuminated. Pulsing together in “phase synchronization” the fireflies were gathering together like a massive hive. It was so eerie, Wendy was afraid to approach, but the booze made me curious and brave. I walked quietly up, practically tugging Wendy along behind me. I started to make out a form underneath the hive and then realized, not 10 feet from the mass, it was a small human form. “Hello?” I offered the human mass. The face of a small boy turned slowly toward me. My bug-eyed God. He must have been a sort of firefly Jesus. As the boy finally faced us, his eyes grew wide and shockwave ran through his body. The fireflies seemed to recognize his anxiety and burst away. The boy ran from behind the mass and I started after him but not even the fingernail of moon illuminated him. Wendy stood there, jar opened, catching as many fireflies as she could. “What are you doing?” I asked in complete anger. These animals had some sacred bond to the boy. To collect them would be like collecting votive candles from a Catholic Church. She shrugged. Fireflies captured in long exposure. We spent the beginning of the next class faking our own suicides again, but I wasn’t into the suicide routine in quite the same way I had been the first week. All our specimens were lined up on the wall, dead, no longer able to light the way for their mates. Dr. Foghett dissected them, showed us their chemical bulbs, threw them away. On Thursday, our second to last day in camp, Dr. Foghett sent us out one last time to collect specimens to bring home to study their DNA. We would mash them and throw their guts into a centrifuge. For what end? I wasn’t too sure. I was a bit sick of Wendy by then. The incident in the woods had rubbed me like sandpaper on my tongue. I could still taste her deception. So I acted as if my sickness with her was a real sickness. I stayed at the camp long enough to know she was somewhere deep in the darkness. Then I headed out toward the boy again. We had walked a weaving, drunken path that night the week before. But I trusted my senses even though I had a fear I was lost more than once. Finally I saw the pulsating mass again between the pines. I walked slowly closer. Then I noticed a tall figure next to the child. Dr. Foghett bent down next to the boy. He whispered something I couldn’t hear. I walked closer and finally the doctor noticed me. He put a finger to his lips. The scene reminded me of sacred Hindu practice. Suddenly a voice came roaring up behind me. It was Wendy, trashed. My skin reverberated. The fireflies noticed the agitation too and swarmed together upward, no longer pulsing in rhythm. The boy ran and Dr. Foghett turned down his head. It was very dark in the woods. We were two men and a woman of science. –(I)t’s a (B)eautiful (D)ay, (I) (N)eed a (D)rink, Inc. This entry was posted in The Word and tagged bioluminescence, DNA arrays, Entomology, Fireflies, light, lightning bugs, Mark Twain, Wendy. Bookmark the permalink.